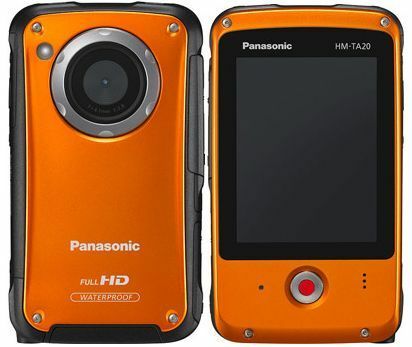 Panasonic has introduced its new compact Panasonic HM-TA20 HD mobile camera, named as Panasonic HM-TA20, which adopts a triple tough design – waterproof (3m), dustproof and shockproof (1.5m). In addition to the tough design, the Panasonic TA20 is featured with Night View mode for effortless shooting in dim lit areas, thanks to the frame rate of 1/15, capable of capturing 8 megapixel still shots and full HD (1920×1080 pixels) movie. The new ultra-compact Panasonic HM-TA20 digital camcorder will be offered in orange and blue colors, but no words on its exact availability date and pricing info yet.